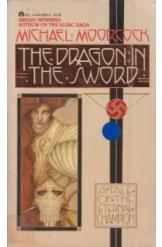 The Dragon in the Sword by Michael Moorcock, Sci Fi. Book is in good condition, all pages intact. As the Eternal Champion, John Daker travels across worlds and throughout time to protect mankind from evil. On a quest to search for his lost love Ermizhad, Daker encounters a web of slavery and piracy centered around a man named Adolph Hitler. Part of the Eternal Champion series.